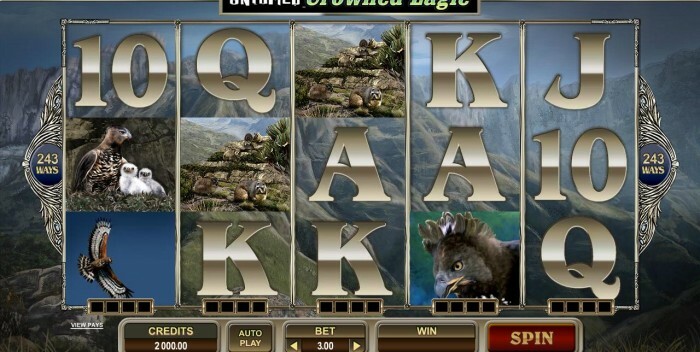 Play the Brand New Untamed – Crowned Eagle for nothing here on Free Slots X! If you think that free slots means that you only get to try out some of the older games available from top companies like Microgaming, then think again as this March, you’ll be able to run your eyes over a brand new release, completely free of charge! The fabulous new Untamed-Crowned Eagle slot is the latest in the Untamed series of games from Microgaming and this 5-reel, 243-payline slot released on the 5th March 2014. Best of all, here on our free slots website, you’re able to preview this game and play through it completely free of charge, before trying it out for a real using a trusted link to a partner casino direct from this site! What can you expect from the Untamed Crowned-Eagle slot? Well as with the other games in the Untamed series, it is packed with features including Collect-A-Wild, Lucky Nudge, Your Gamble and Soaring Wilds features, each of which brings an added dimension to the slot and gives players an even better chance of landing the win. The Lucky Nudge feature, for example, is activated when you have two Scatter symbols on screen but a third just off, but Lucky Nudge will then nudge the offending Scatter back onto the payline, activating the Free Spin section! With Soaring Wilds offering the chance to turn symbols wild in free spins, plus a random multiplier of up to 10x your winnings, there’s plenty of cash to be won, in fact the jackpot of the game is a whopping 90,000 coins. So why not take your fledgling flight on the free slots version of the game and get used to how it plays before you put your money where your mouth is and fly the nest to try for real money! 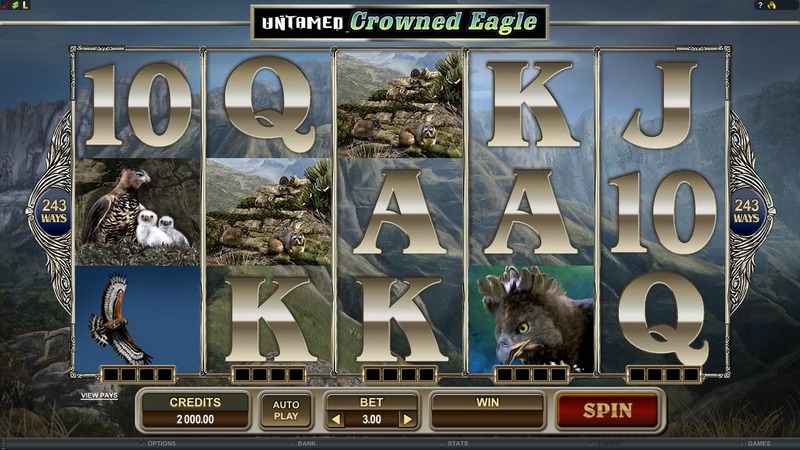 Play the Untamed Crowned Eagle Slot now for FREE! Get up to $€£1000 Bonus at Luxury Casino and start playing for real! Click here to claim now! Eagerly Awaited Slot Sequel Avalon II out now! New Month, New Free Slots: Loose Cannon Fires Up for a March Launch! Play Rugby Star this autumn! Battle the gods for cash on the Hot as Hades slot at Slots X!